Attend a Workshop. Click here to register for an upcoming workshop! Use our rebate calculator to estimate your project costs. Apply for the Program. Click here to apply and participate in the NatureScape program. Pre-Qualification Assessment. Contractor will inspect and assess the irrigation system and service location to confirm the site satisfies the minimum eligibility requirements of the program. Contractor will complete assessment in 1 day. Landscape Design. Contractor will provide Applicant with a design consultation which will discuss the turf removal method, potential landscape layouts, a native plant palette, and estimated project costs. Contractor will complete the landscape design and contact the Applicant to schedule the design delivery within 1 week. Turf Removal. Contractor will begin turf removal process. Contract will complete the turf removal process in 1 day. Landscape Installation. Contractor will complete the installation of a new native landscape so that when mature, at least 75% of the rebated portions of the landscape will consist of plant material. Contractor will complete landscape installation within 14 days. Post Installation Education. 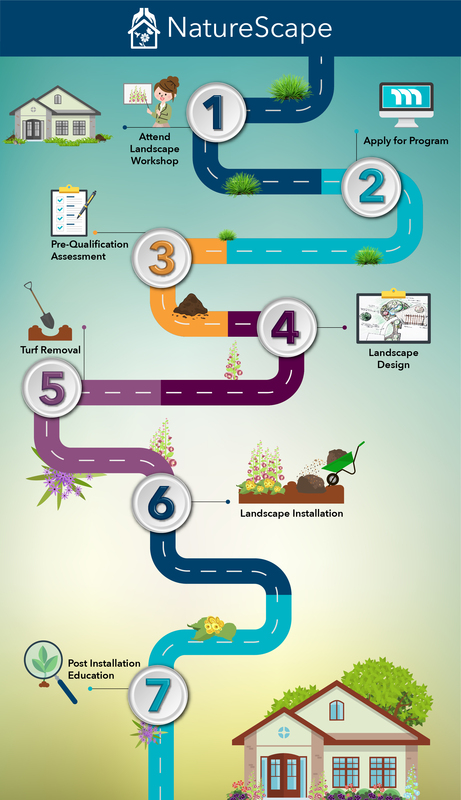 90 days following landscape installation, Contractor will provide education to the Applicant on how to properly care for and maintain plants and landscape. Most projects are complete in as little as 6-8 weeks.